Paul Bradshaw, one of the world's foremost scholars on the history of Christian liturgy, has shared this expertise in several works that have become standard texts for students of liturgy. In Rites of Ordination, Bradshaw turns his attention to the ways that Christians through the ages have understood what it means to ordain someone as a minister and how that has been expressed in liturgical practice. Bradshaw considers the typological background to ordained ministry some have drawn from the Old Testament and what ministry meant to the earliest Christian communities. He explores the ordination rites and theology of the early church, the Christian East, the medieval West, the churches of the Reformation, and the post-Tridentine Roman Catholic Church. 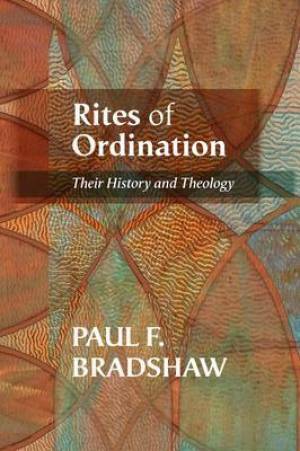 Rites of Ordination by Paul F. Bradshaw was published by SPCK in January 2014 and is our 42180th best seller. The ISBN for Rites of Ordination is 9780281071579. Paul Bradshaw is one of the church's leading writers on the liturgical practice of the Christian Church. In this volume Bradshaw focuses on the practice of ordination, tracing its origins in the customs of the earliest Christian communities through to the current practice in both Roman Catholic and Protestant communities. Largely organised chronologically, Rites of Ordination is both a theological as well as a historical study. Despite its conciseness—and Bradshaw is honest about the volume's limitations—this is unlikely to be a book with wide appeal. Even those approaching their own ordination might struggle to find much in it that will infuse their own ministry with energy or understanding. This is at heart an academic work, although those with an interest in strengthening ecumenical relations will find much in it to encourage that task. Bradshaw is to be complimented for a writing style that is very accessible. The topic might not be on everyone's lips, but one cannot fault Bradshaw's determination to ease our way into understanding one of the most significant facets of ecclesial life today. Got a question? No problem! Just click here to ask us about Rites of Ordination.